I am currently glued to BBC for 3 hours now watching the most anticipated royal wedding. The whole world is tuned in for sure. 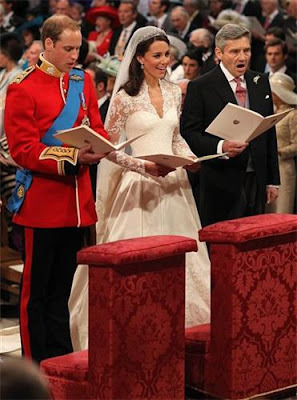 It's not every year a British monarch (a very paparrazied one since birth at that) gets married. And to stroke every girl's fancy, he married a commoner - in contrast to most consorts-in-waiting for over 350 years. HRH Kate Middleton is gorgeous in her gown. I love her choice! Her simple yet very elegant McQueen gown is perfect for her slim and tall frame. I love that she didn't choose a big, bulky, garrish gown. And the dainty tiara, loaned by the Queen herself, brilliantly complements her wedding dress. Growing up I fantasized, once or perhaps twice, about marrying Prince William. He was such a handsome boy. Like most girls who watched the funeral of the late Lady Diana, I wanted to hold him close and just hug him hoping to ease the pain of losing his mum at such a young age. But watching the wedding now I am not feeling a sense of loss (char!). Just happy that it's his choice, marrying his girlfriend of many years, that he has married for love that most monarchs have no luxury to do.